When you do something repeatedly, it becomes fairly easy because it's familiar. I have been an outdoor instructor for almost eight years of my life and I liked my job, but on most days I took my job for granted just because it was simple. 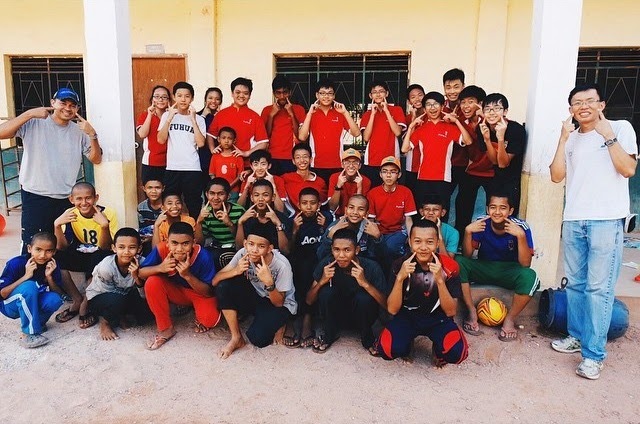 Hence, I took a challenge and only since two years ago, I started bringing students for overseas camps. Even then, I still took my job for granted. Because adding on to what I have been doing, now I get to travel for free and I don't even have to look good or be polite. I just need to know my stuff and be friendly to everyone to like me enough to do what I tell them to do. Yay. It's a love hate relationship with this job. However, I have always looked at it in a perspective where the kids should learn something from their camp or trip. My debrief pointers can make my campers cry and then hate me and then miss me when they are back in school. I do it so often that I never realized that I can actually learn from my job too. Not until three days ago. For the first time in a long time, my eyes were actually opened to how blessed I am to be able to live in a country that has perfectly built roads and even though we are living in buildings made to look like Uno stackos, we actually have concrete walls that are complete from top to bottom, ceilings that don't crumble and smooth floors under our feet. Imagine having twenty beds cramped into a square room, only one light bulb, toilets without proper plumbing systems, floors that have been collapsed and rebuilt many times, houses that are dark even in broad daylight. I don't think I could survive a lifestyle like that, neither would anyone I know. I bring my camera everywhere I go but I couldn't even bring myself to snap a photo of what I witnessed. Not because I sympathized them, but because I did not want anyone to degrade or even feel sorry for them. They don't need sympathy, really. They are happy with the way that they are. But if you could see what I have seen and still not feel blessed or appreciative of what you have then, it really says alot about what kind of a person you are. I'm happy to say that the bunch of students I brought along for this camp has reached the goals that they set for themselves before the camp and have met all of the objectives that they set out to achieve. They definitely proved me wrong about the stereotype that Singaporeans have on Normal Academic students, being able to do so much within the short period of time that we spent there and for even taking care of me when it should be the other way around. I don't think I have to list down all the amazing things that they have done - they know it themselves. I rarely even write about my campers but this bunch is different, I dare say that after eight years - this is the best camp I've ever conducted. Thank you 3S8 for being a part of my career and for making a difference. You guys were and always will be a joy to me. Stay awesome, buggers. Aw, this made me smile. Good job.